Visualization of data sounds like an easy proposition; collect data and display it. But there’s a lot more to it than that! What data should be displayed? If you collect data from, say, 200 systems, do you want to see data about each system or an overview of them all? If half of them are Windows systems and half are Linux systems, you might want to see overall utilization of each group. 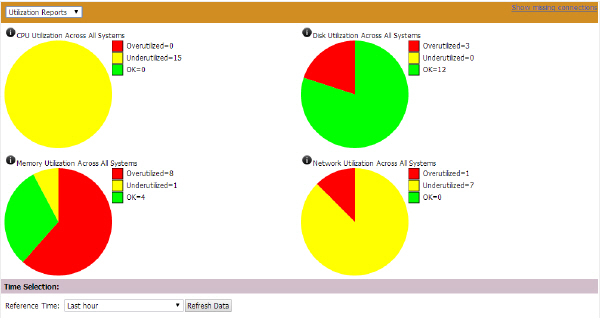 Or, how about a view that shows which systems might be underutilized in terms of resources used? We call this discussion the Nerd View vs. the Management View. Just ask our development team! The classic nerd here at Sightline likes data, and lots of it. We want to see the details about every system, its resources, its workloads, throughput, you name it. We need drill-down to the process level data, and the ability to set alerts. Basically, if it can be collected and displayed, we want it. Management requirements are a little different. Management needs to know that the environment is in good shape, but still needs to retain the capability to drill down if necessary. Management wants to know that the critical applications are up and running and making money for the company. Using EDM, you can have your cake and eat it too! Consider this display, a typical nerd view. 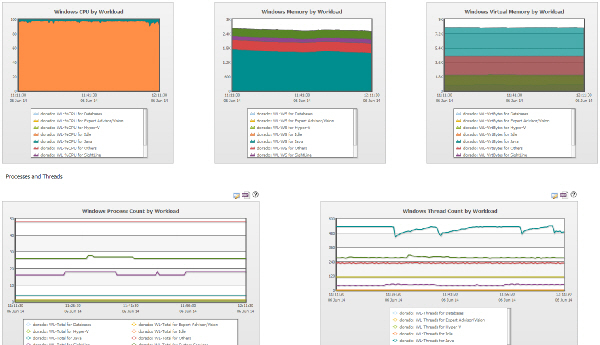 Lots of detail about the system workload: cpu and memory breakdown per workload, and the numbers of threads and processes for each workload. Event data would fall into this category, as well. On the other hand, management wants a higher-level view, or a view to support a specific application, service or report. They want to see something like this: an overall view of resource consumption, as in Sightline’s new Utilization Reports. This shows which systems are over- or under-utilized in terms of cpu, memory, disk and network resources. With the depth of data available from Sightline data collection agents, we can show whatever you need to see. Remember, we’ve got IT covered.